buy genuine Seroquel online http://johnhpalmer.com/?p=635 Why Join a Union? In today’s uncertain political and economic climate, workers need the protection and peace of mind that only a Collective Bargaining Agreement (CBA) can provide. As the “Profit Before People” motives of corporations become stronger and stronger, many good and loyal workers are suffering and opportunities are diminishing. The only viable remedy is for working people to join together as a Union and bargain for fair pay and working conditions. The IAM has a long history of representing workers employed by Federal Government contractors. With over 40,000 members employed in the Service Contract Act sector, our collective bargaining agreements are second to none, and our members enjoy the highest wage and benefit levels in the industry. Whether you work for a large corporation like Lockheed or a small start-up aerospace contractor, throughout our history we have been able to work with employers to improve the lives and livelihoods of our members. However, when employers fail to act in faith to resolve issues with the IAM or if they failed to live up to negotiated wages, benefits or working conditions we are ready to take action to remedy the situation through our negotiated grievance procedure and if necessary, we will take the employer to task with the federal government. Q: What is the Service Contract Act? A: The McNamara-O’Hara Service Contract Act of 1965, as amended, provides labor standards for certain persons employed by Federal Contractors to furnish services to Federal agencies. Most civilian contractors working on military bases or in federal facilities are covered under the Service Contract Act. Q: How are wages determined under the Service Contract Act? A: For UNREPRESENTED employees, Minimum Wage Rates are determined by the US Department of Labor by doing periodic wage surveys in the locality in which the Service Contract employees work. Then, they issue a document which is called the “Wage Determination.” For REPRESENTED employees who engage in collective bargaining, the wages and benefits negotiated as a result of “arms length negotiations” replace the Wage Determination and serve as the minimum prevailing wage for that particular service contract. Q: How are fringe benefits determined under the Service Contract Act? A: For UNREPRESENTED employees, the same wage determination lists minimum fringe benefits. The Dept. of Labor has established a rate of $4.27 per hour. But, for REPRESENTED employees, fringe benefits negotiated as a result of “arms length negotiations” become the minimum fringe benefits for that particular Service Contract. Q: What happens when a new Service Contractor takes over the Service Contract on which I am working? A: Under the Service Contract Act, a new Service Contractor is not required to hire any of the existing Service Contract employees. For UNREPRESENTED employees, the new Service Contractor who has won the bid away from the current Service Contractor, only has the obligation to pay the minimum rates established by the Department of Labor’s wage determination. And, they can work with less people, for less hours, lower classifications! Remember, the service contract was awarded to the lowest bidder. For REPRESENTED employees, section 4C of the Service Contract Act, provides that no contractor who succeeds a previous Contractor, will pay any service employee under such contract less than the wages and fringe benefits (including accrued wages and fringe benefits) provided for in the collective bargaining agreement. Normally, when a service contract is being re-bid, the competing Contractors will contact the Union representative and attempt to reach an agreement on the conversion and indicate so in their bid insuring that labor peace prevails. With a skilled workforce like yours, virtually all Contractors will agree to honor the terms and conditions of the collective bargaining agreement. Q: Will my employer suffer a loss in profits if they pay more than the Department of Labor’s wage determinated rates in my Collective Bargaining Agreement? A: When your employer pays UNREPRESENTED employees wages and benefits which are higher than provided for in the Department of Labor’s wage determination, those increases will affect profits. However, wages and benefits negotiated for REPRESENTED employees are passed through to the customer, usually the federal government, once a year: normally this is effective October 1st of each year, but it can vary for different branches of the military. Q: Well, isn’t this gouging the Government? A: NO! There are two reasons why; first if the negotiated wages and benefits are at valiance the USAF can challenge. The second reason is Government believes ‘Collective bargaining at arms length’ is the very best way to determine wages and benefits. The Government has confidence that private sector contractors and their employees who engage in collective bargaining will reach the very best rate. That’s why the Service Contract Act recognizes and honors rates and benefits negotiated at ‘arms length’ through collective bargaining. The U.S. Government knows that the Service Contract Act has saved billions of dollars for tax payers and still delivers quality services to the customer. 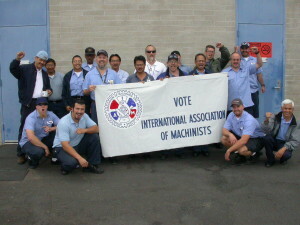 Q: How can I get good strong Machinists Union Representation? A: The first step in gaining Machinists union representation is to contact us today and speak with an organizer about the particulars of your situation. Working together we can help you achieve collectively what you have not been able to achieve alone. Working together, we can make your workplace a better place to work.